If I could get more side dish recipes out of this new recipe from my recipe binders weekly challenge, I would be really happy. My standard go to side dishes for dinner is really boring, but easy. I usually do steamed rice made in my rice cooker and then a steamed vegetable, usually broccoli or green beans. We need a change for sure. 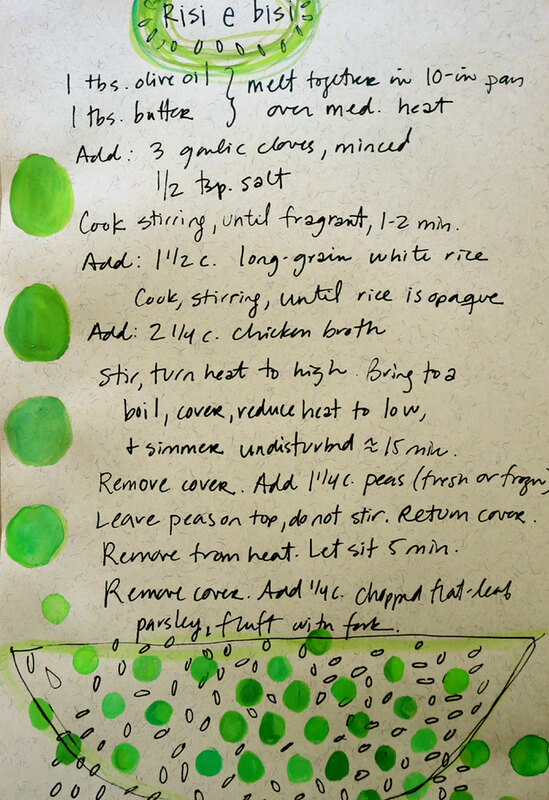 This rice dish came from Sunset Magazine, May 2007 issue. My son just turned 11 last week and I’ve kept this recipe in my binder and never tried since he was 4 months. Good grief. I think I must have FOMO for recipes that I collect. Anyway, we’re keeping this one and it went into my notebook with simple gouache illustration. I didn’t add the parsley because I didn’t have any. I don’t think it needs it. Everyone loved this dish. My PO (new name for PBJ and stans for my “picky one”) ate some of it reluctantly as she loves plain steamed rice and not rice cooked on the stove. She may have eaten a pea or two. But for everyone else it was a big hit. Super easy and actually can be made with leftover rice if you have some, just leave out the whole cooking the rice part of the recipe. Here is a link to the recipe online. Okay, making this tonight along with your Salmon with Brown Sugar and Mustard Glaze!!!! I will toast to you before we eat as I know my husband will love both recipes!!!!!! yay! I'm so glad you guys enjoyed it all. Happy that me doggedly going through all my recipe files benefits more than just my family's table! I love food, creating food and sharing delicious finds.